The concern for protecting the environment continues to be a growing trend among the U.S. population. What was once thought of as a passing fad has now become a fundamental shift in consumers’ attitudes and behaviors. It is more than just a general sentiment of protecting the environment, however, as consumers are becoming more concerned with specific issues such as climate change, deforestation, sustainable agriculture and fair labor practices. These are many of the focus areas of the Climate Collaborative, which is partnering with New Hope Network to host the Climate Day conference on March 8 at Natural Products Expo West. As these issues become more mainstream, consumers are growing more knowledgeable, and with that, they show high interest in aligning their personal values with the products they consume. Environmentally friendly product attributes are no longer a "nice-to-have"—they are expected. These expectations are not limited to the finished product either, as transparency and corporate responsibility is scrutinized by the public all along the product chain. Companies will need to recognize these expectations and change corporate culture in order to remain successful, as sustainability concerns are only poised to grow over the coming years. It is important to realize that the population is diverse and made up of consumers who approach sustainability somewhat uniquely. 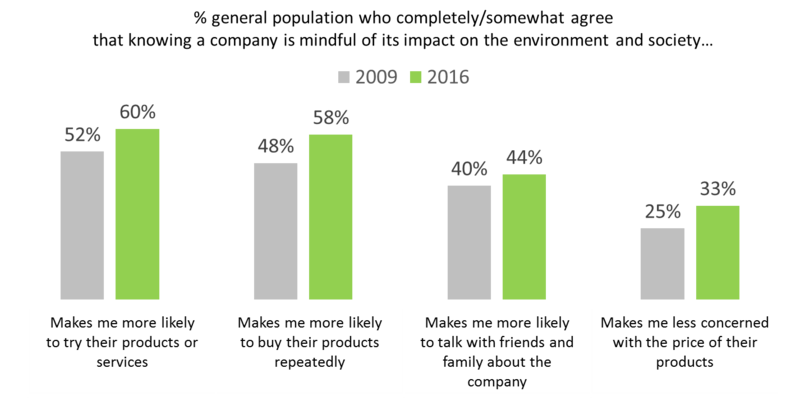 While some consumers have "deep green" consciousness, there are varying levels of consumers within the American population. NMI’s consumer segmentation model reveals five consumer groups. "LOHAS" consumers are the greenest and are integral in helping to drive sustainability attitudes and behaviors. The more mainstream segments ("Naturalites," "Drifters" and "Conventionals") also hold "green" attitudes and participate in green behaviors, but their motivations are differentiated. And lastly, there's the "Unconcerneds," those consumers trying to determine the true role of sustainability in their lives. By understanding consumers’ green orientation, organizations are better equipped to determine how to target the most optimal segment with the most relevant messaging. As concern for the environment and subsequent green behaviors continues to grow among consumers, products and companies that keep sustainability as a focus are being viewed in a more positive light. NMI trended research shows that consumers who know a company is mindful of its environmental impact are more likely to try, purchase and spread the word about that company’s products or services. And while purchase decision is ultimately determined by price, many consumers indicate a willingness to pay a premium for products that align with their values. Despite these positive trends, companies still face challenges. There is general skepticism among consumers when it comes to companies’ motives for sustainable initiatives. A majority of the population feels that companies only embrace social and environmental issues when they are profitable. Additionally, many are confused about messaging and feel that there are too many eco seals and certifications. This only serves to create further mistrust among consumers. To overcome these barriers, appropriate messaging, consumer outreach and corporate transparency, such as the Climate Collaborative, will play an important part in gaining the trust of consumers and will be vital to the success of any company’s sustainable strategy. While many companies may find sustainable initiatives such as saving energy and reducing waste to be financially beneficial, companies that are embracing sustainability as a holistic means of doing business are reaping even wider benefits among an increasingly environmentally and socially conscious population. Companies who embrace sustainability and apply the relevant sustainable initiatives across its brand portfolio where most applicable will be better positioned to meet consumer demand for a higher level of corporate responsibility. While at times it can be difficult to measure the return on these initiatives, it is evident that protection of the planet, its people and the environment can only have positive returns. Attend Climate Day at Natural Products Expo West, or watch it live online. Where: Marriott, Grand Salon F, and on newhope.com.